Two of the most famous mosaics from the ancient world, in the church of San Vitale in Ravenna, depict the sixth-century emperor Justinian and, on the wall facing him, his wife, Theodora (497-548). This majestic portrait gives no inkling of Theodora’s very humble beginnings or her improbable rise to fame and power. Raised in a family of circus performers near Constantinople’s Hippodrome, she abandoned a successful acting career in her late teens to follow a lover whom she was legally forbidden to marry. When he left her, she was a single mother who built a new life for herself as a secret agent, in which role she met the heir to the throne. To the shock of the ruling elite, the two were married, and when Justinian assumed power in 527, they ruled the Eastern Roman Empire together. Theodora’s is a tale of a woman of exceptional talent who overcame immense obstacles to achieve incredible power, which she exercised without ever forgetting where she had come from. 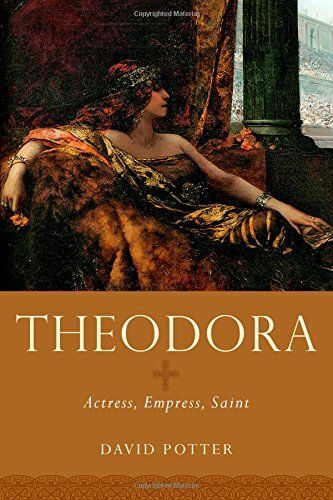 In Theodora: Actress, Empress, Saint, David Potter penetrates the highly biased accounts of her found in the writings of her contemporaries and takes advantage of the latest research on early Byzantium to craft a modern, well-rounded, and engaging narrative of Theodora’s life. This fascinating portrait will intrigue all readers with an interest in ancient and women’s history.